To examine its biological activity in vivo, rMuFGF-18 was injected into normal mice and ectopically overexpressed in transgenic mice by using a liver-specific promoter. Injection of rMuFGF-18 induced proliferation in a wide variety of tissues, including tissues of both epithelial and mesenchymal origin. The two tissues which appeared to be the primary targets of FGF-18 were the liver and small intestine, both of which exhibited histologic evidence of proliferation and showed significant gains in organ weight following 7 (sometimes 3) days of FGF-18 treatment. Transgenic mice that overexpressed FGF-18 in the liver also exhibited an increase in liver weight and hepatocellular proliferation. These results suggest that FGF-18 is a pleiotropic growth factor that stimulates proliferation in a number of tissues, most notably the liver and small intestine. Treatments consisted of intraperitoneal injections with either 5 mg of rMuFGF-18 or vehicle per kg. 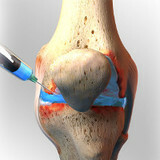 So we're talking about injection into an area that will likely cause a more systemic reaction, and a dose that is orders of magnitude higher than what is used to regenerate cartilage in knees, for instance (where it is injected IA). Not too much of a cause for concern IMO.